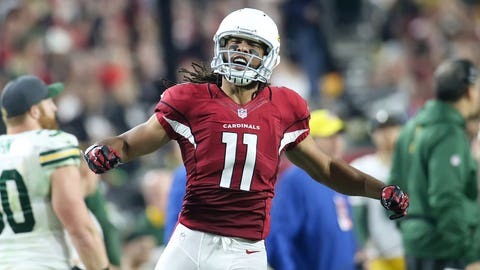 Larry Fitzgerald has spent all 12 years of his NFL career with the Cardinals after being drafted with the third pick in 2004. Sports Illustrated has selected Fitzgerald for its Western regional cover — the rest of the nation gets Peyton Manning-vs.-Tom Brady on the cover. Nice company to keep — three of the iconic stars of our era. SI writer Aaron Murphy chronciles how Fitz and company one-upped Aaron Rodgers in what the magazine headlines "Best Finish Ever." Fitz, of course, is far from finished, and in addition to the Sports Illustrated coverage, he’s also authored a first-person piece on theplayerstribune.com about how he’s evolved as a person and how far the Cardinals and the community have come since he was drafted with the third pick in 2004 — when the overriding perception was that the team was incapable of winning a Super Bowl. He reflects back on the difficulties of being a Cardinals’ fan, the gradual culture change, the near-miss against the Steelers in 2009 that he still can’t bear to watch. Carson Palmer: "He’s the captain of the offense, and we all follow his lead." Patrick Peterson: Every time I face (Peterson) in practice, I’m so thanking we’re on the same team. Tyrann Mathieu: "It’s an honor to be his teammate. … If there’s any one player that embodies what this franchise is about and why it will continue to find success, it’s Tyrann Mathieu. He is the heart and soul." He concludes that he’s indebted to the city for "everything it’s given me." He suggests that the Cardinals can be a unifying force for everybody in the state, from recent transplants to native Arizonans. Hear, hear — we couldn’t have said it any better.